I have a thing for picnic baskets. I love the fantasy they create, the ideal of a lazy summer day on a bright green lawn or a sandy beach, gourmet cheese and wine in hand, with laughter in the air. In fact, I like picnic baskets so much I have several along with items for my basket, wine bottle holders, wine glass holders, special plates and blankets. I own all of this for the idea that some day I'll be a picnic goer. The truth is, in the real world, I'm a cooler girl - I like one with a strong handle and wheels. 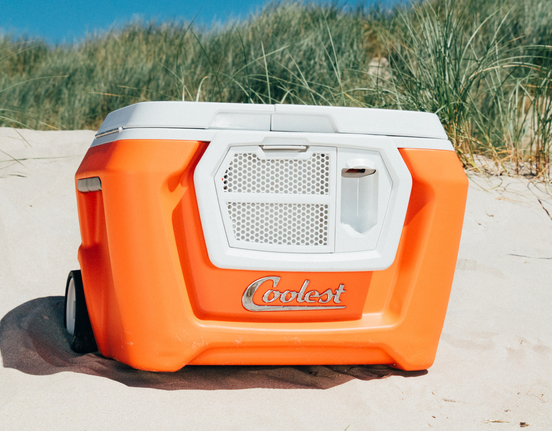 The cooler that can hold a case of water and an entire watermelon. As much as the picnic basket picture plays out in my mind - functionality gets the best of me. A picnic basket is a terrible place to store a bag of ice - or anything that needs to stay cold. A picnic basket cannot be loaded down with a case of water - it hardly holds one french baguette. A picnic basket does not have wheels and is difficult to carry across parking lots and 25 ball fields. My love affair with the picnic basket is drawing to a close. Using a cooler, I can still spread a blanket and eat gourmet cheese and drink a glass of wine - but I won't be exhausted from lugging the basket and my wine will be cold. I have not received any payment from this endorsement but if the good folks @coolest.com want to send me a cooler - I'm okay with that!